40 D I V E R S I T Y W O M A N W i n t e r 2 0 1 8 d i v e r s i t y w o m a n . c o m stored on them. at means using a wipe utility program to overwrite the hard drive. Even in today's modern high-tech world, dumpster diving still exists. 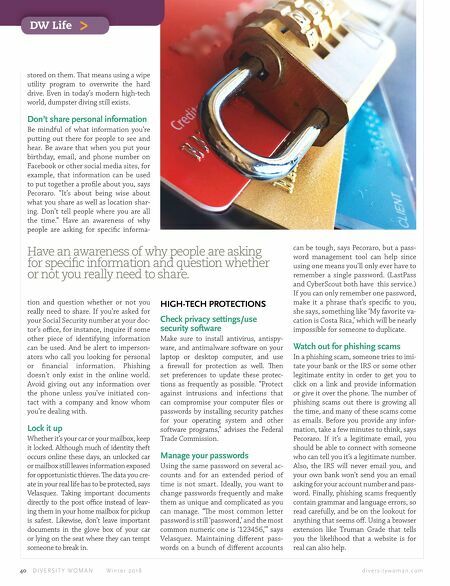 Don't share personal information Be mindful of what information you're putting out there for people to see and hear. Be aware that when you put your birthday, email, and phone number on Facebook or other social media sites, for example, that information can be used to put together a profile about you, says Pecoraro. "It's about being wise about what you share as well as location shar- ing. Don't tell people where you are all the time." Have an awareness of why people are asking for specific informa- tion and question whether or not you really need to share. If you're asked for your Social Security number at your doc- tor's office, for instance, inquire if some other piece of identifying information can be used. And be alert to imperson- ators who call you looking for personal or financial information. Phishing doesn't only exist in the online world. Avoid giving out any information over the phone unless you've initiated con- tact with a company and know whom you're dealing with. Lock it up Whether it's your car or your mailbox, keep it locked. 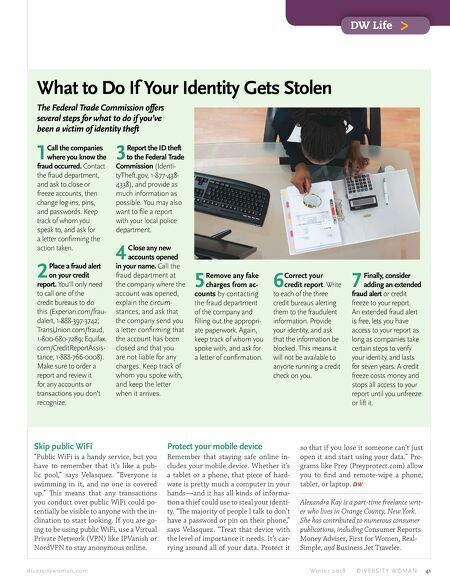 Although much of identity theft occurs online these days, an unlocked car or mailbox still leaves information exposed for opportunistic thieves. e data you cre- ate in your real life has to be protected, says Velasquez. Taking important documents directly to the post office instead of leav- ing them in your home mailbox for pickup is safest. Likewise, don't leave important documents in the glove box of your car or lying on the seat where they can tempt someone to break in. HIGH-TECH PROTECTIONS Check privacy settings/use security software Make sure to install antivirus, antispy- ware, and antimalware software on your laptop or desktop computer, and use a firewall for protection as well. en set preferences to update these protec- tions as frequently as possible. "Protect against intrusions and infections that can compromise your computer files or passwords by installing security patches for your operating system and other software programs," advises the Federal Trade Commission. Manage your passwords Using the same password on several ac- counts and for an extended period of time is not smart. Ideally, you want to change passwords frequently and make them as unique and complicated as you can manage. "e most common letter password is still 'password,' and the most common numeric one is '123456,'" says Velasquez. Maintaining different pass- words on a bunch of different accounts can be tough, says Pecoraro, but a pass- word management tool can help since using one means you'll only ever have to remember a single password. (LastPass and CyberScout both have this service.) If you can only remember one password, make it a phrase that's specific to you, she says, something like 'My favorite va- cation is Costa Rica,' which will be nearly impossible for someone to duplicate. Watch out for phishing scams In a phishing scam, someone tries to imi- tate your bank or the IRS or some other legitimate entity in order to get you to click on a link and provide information or give it over the phone. e number of phishing scams out there is growing all the time, and many of these scams come as emails. Before you provide any infor- mation, take a few minutes to think, says Pecoraro. If it's a legitimate email, you should be able to connect with someone who can tell you it's a legitimate number. Also, the IRS will never email you, and your own bank won't send you an email asking for your account number and pass- word. Finally, phishing scams frequently contain grammar and language errors, so read carefully, and be on the lookout for anything that seems off. Using a browser extension like Truman Grade that tells you the likelihood that a website is for real can also help. DW Life > Have an awareness of why people are asking for specific information and question whether or not you really need to share.